Live in Chicago? 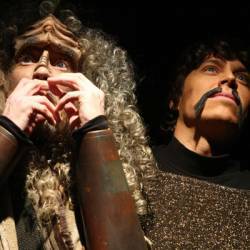 Then how about a little Xmas trip to the theatre to see ‘A Klingon Christmas Carol’, running November 25th to December 31st 2011. Wonder what that Christmas Goose looks like? Probably has a few more appendages, a beak, and a snout stuffed with wriggly bits? Wash it down with your enemies’ blood, Darwin. Then it tastes fine!